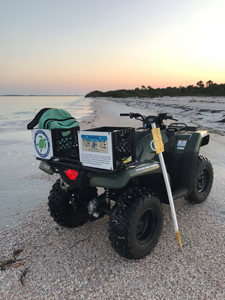 Summary: The Sea Turtle Conservation Program at Clearwater Marine Aquarium (CMA) will purchase an all-terrain vehicles (ATV) and associated pre-season preparation to perform morning sea turtle nesting surveys along 21 miles of beach in Pinellas County, Florida. A record number of nests, 318, were recorded by CMA in the 2016 nesting season, a 37.6 percent increase from the previous record season in 2013. Unfortunately, this season has also yielded record maintenance costs for the nesting vehicles, as well as costs to rent replacement vehicles to ensure primary patrol completion. CMA was unable to replace this unreliable fleet. The ATV will completely replace the current nesting vehicles and be strategically placed along the survey route that allow access to the street and the nesting beach. The ATV will be an integral part of successfully completing primary nesting patrol, improve data collection and efficiency, and allow authorized personnel time to act as stewards for marine turtles and educate beachgoers on steps they can take to conserve sea turtle populations. In a broader scope, a reliable nesting vehicle may contribute more precise data to the FWC Statewide Nesting Beach Survey, and potentially contribute to marine turtle population trend studies in the future. Results: Pre-season preparation, including the purchase of additional engine coolant, for the Honda Rancher was completed by the end of March. CMA received a discount for this maintenance work at West Coast PowerSports, such that additional funds were available to use. Sea Turtle Conservancy generously allowed CMA to utilize the funds to prepare three additional ATVs in CMA's fleet for the nesting season. Therefore, these funds made it possible to prepare four ATVs for the 2018 nesting season. CMA Sea Turtle Conservation Program staff underwent training on the safe operation and handling of the vehicles on 7/4/17. Training also included the use of personal protection equipment, how and when to check fluid levels, and an overview of regular machine maintenance. Staff then trained volunteers throughout the month of March 2018 on safe ATV operation, including guidelines set forth in FWC's Best Management Practices for Operating Vehicles on the Beach.